Congressional Pugilists. Philadelphia, 1798. Political Cartoons Collection. The Library Company holds three editions of the second state. The first state (Cudgeling as by Late Act in Congress) is only available electronically via Evans. Depicts a floor fight between Rep. Roger Griswold (Connecticut) and Rep. Matthew Lyon (Vermont). Lyon spat in the face of Griswold after the latter shared a rumor that he had been sentenced to wear a wooden sword as punishment for cowardice in battle. Several days later, Griswold attacked Lyon with a stick, who defended himself with fireplace tongs. Shows interior of Congress Hall with Speaker Jonathan Dayton and Clerk Jonathan Condy (seated), Chaplain Ashbel Green (in profile on left) and others watching. And Griswold thus engag’d, sir. William Birch, Preparation for War to Defend Commerce. Philadelphia, 1800. Birch’s Views. Shows Federal Street near the Delaware River. Several laborers construct the U.S. Navy warship, Philadelphia, a frigate built to defend the nation’s merchant fleet from foreign enemies. Construction occurred at Wharton-Humphreys shipyard from 1798 to 1799, under naval builder Joshua Humphreys. Laborers saw, ax, and carry wood up a long plank to the top of the hull of the unfinished ship. A man, possibly Humphreys or the ship designer, Josiah Fox, and a woman, watch the construction from the side. Several buildings stand in the background, including the city’s oldest church, Gloria Dei (Old Swedes) Church, built in 1700. The Providential Detection. Philadelphia, 1800. Political Cartoons Collection. Against the backdrop of the French Revolution and war between Britain and France, bitter party feelings emerge in the United States. French partisans assail George Washington’s policy of neutrality and Jay’s Treaty with Great Britain. Thomas Jefferson, seen as friendlier with France, finds himself associated with some of the most damning features of the French Revolution. Northern commercial groups, favorable to Jay’s Treaty, attacked Jefferson as advocate of social disorder. Shows Jefferson kneeling before the altar of Gallic despotism. 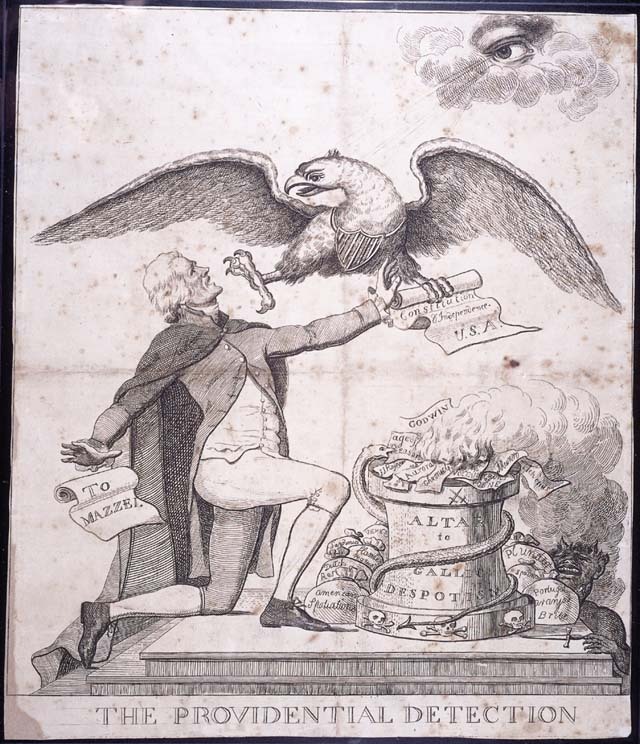 God and an American eagle attempt to prevent him from destroying the United States Constitution (“Constitution & Independence U.S.A.”) which he prepares to fling into a fire fed by the flames of radical writings. Jefferson’s alleged attack on George Washington and John Adams in the form of a letter to his Italian friend Philip Mazzei falls from Jefferson’s pocket. Jefferson is supported by Satan, the writings of Thomas Paine, and the French philosophers. William Charles, The Cat Let Out of the Bag. New York, 1808. Political Cartoons Collection. A pro-Jefferson cartoon in support of the U.S. Embargo Act of 1807. Passed in retaliation to British and French neutral trade restrictions, the Embargo Act forbade all international trade to and from American ports, severely compromising the American shipping industry.